Oil has started this year well rallying from 16 month lows below $50 at the end of last year, back up to the key $58 level and beyond, after its doom and gloom to close out 2018. The $58 level continues to play a role and has provided some support in the last couple of weeks as oil consolidates a little in that time. The $58 level supported oil very well for several weeks at the end of last year and is likely to continue to do so. Starting at the beginning of October, oil fell sharply from its multi-year high above $86 down to its lowest levels in 12 months below $58 at the end of November before falling lower to 18 month lows a couple of weeks ago. 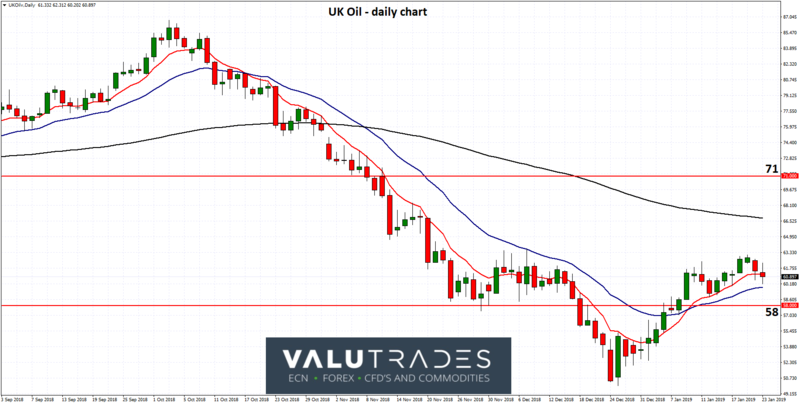 For several weeks, oil was able to find some much needed support from around $58 and enjoy a reprieve from the immense selling pressure which has dominated it for the last couple of months prior, which is why this level has currently significant. A couple of months ago oil hit the key level of $71 where it did receive some temporary support from, and likewise at $75 which propped up oil for a week. However both of those key levels gave way to immense selling pressure pushing it lower. Whilst not as significant as the current $58 level, the $71 level is likely to offer resistance should oil continue its rally higher. Oil enjoyed a very healthy August and September moving from that key $71 level to its highs before falling back to the same level. Just prior to this pronounced move up to its recent highs, oil was content to remain within its trading range between $71 and $75. Oil is being influenced by a number of factors of late however the overriding factor presently is concerns over a possible global economic slowdown.Other concerns include the ongoing trade war between the United States and China.It is widely accepted that the downside risks of the trade dispute for the market were too big and difficult to quantify, and that China remains the biggest concern, especially given the weakness in the latest economic data.There are also concerns that a widespread economic slowdown may dent growth in demand for fuel.Oil had received a small boost on reports that China and Japan would take fiscal stimulus measures to stem the slowdown, however this was short lived as rising oil output from the United States, together with the effects of the U.S.-China trade war and growing prospects of the United States hitting its debt ceiling started to weight on prices.